A comet—a Greek word meaning "long-haired"—is best described as a dirty snowball. It is a clump of rocky material, dust, and frozen methane, ammonia, and water that streaks across the sky on a long, elliptical (ovalshaped) orbit around the Sun. A comet consists of a dark, solid nucleus (core) surrounded by a gigantic, glowing mass (coma). Together, the core and coma make up the comet's head, seen as a glowing ball from which streams a long, luminous tail. The tail (which always points away from the Sun) is formed when a comet nears the Sun and melted particles and gases from the comet are swept back by the solar wind (electrically charged particles that flow out from the Sun). A tail can extend as much as 100 million miles (160 million kilometers) in length. Through the ages, comets were commonly viewed as omens, both good and bad, because of their unusual shape and sudden appearance. A comet appearing in 44 B.C. shortly after Roman dictator Julius Caesar was murdered was thought to be his soul returning. A comet that appeared in 684 was blamed for an outbreak of the plague that killed thousands of people. For centuries, many people believed Earth was at the center of the solar system, with the Sun and other planets orbiting around it. They also believed that comets were a part of Earth's atmosphere. In the sixteenth century, Polish astronomer Nicolaus Copernicus (1473–1543) proposed a theory that placed the Sun at the center of the solar system, with Earth and the other planets in orbit around it. Once astronomers finally determined that comets existed in space beyond Earth's atmosphere, they tried to determine the origin, formation, movement, shape of orbit, and meaning of comets. In 1687, English astronomer Edmond Halley (pronounced HAL-ee; 1656–1742) calculated the paths traveled by 24 comets. Among these, he found three—those of 1531, 1607, and 1682—with nearly identical paths. This discovery led him to conclude that comets follow an orbit around the Sun, and thus reappear periodically. Halley predicted that this same comet would return in 1758. Although he did not live to see it, his prediction was correct, and the comet was named Halley's comet. Usually appearing every 76 years, the comet passed by Earth in 1835, 1910, and 1986. Astronomical unit (AU): Standard measure of distance to celestial objects, equal to the average distance from Earth to the Sun: 93 million miles (150 million kilometers). Coma: Glowing cloud of mass surrounding the nucleus of a comet. Ellipse: An oval or elongated circle. Interstellar medium: Space between stars, consisting mainly of empty space with a very small concentration of gas atoms and tiny solid particles. Nucleus: Core or center of a comet. 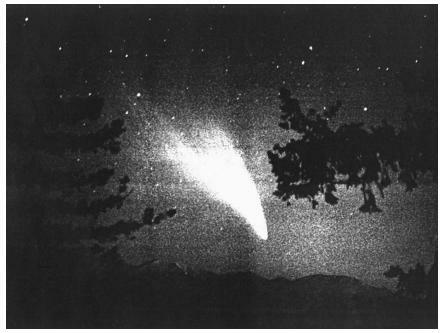 During its last pass over the planet, Halley's comet was explored by the European Space Agency probe Giotto . The probe came within 370 miles (596 kilometers) of Halley's center, capturing fascinating images of the 9-mile-long, 5-mile-wide (15-kilometer-long, 8-kilometer-wide) potato-shaped core marked by hills and valleys. Two bright jets of dust and gas, each 9 miles (15 kilometers) long, shot out of the core. Giotto 's instruments detected the presence of water, carbon, nitrogen, and sulfur molecules. It also found that the comet was losing about 30 tons of water and 5 tons of dust each hour. This means that although the comet will survive for hundreds more orbits, it will eventually disintegrate. Halley's comet will next pass by Earth in the year 2061. On July 22, 1995, American astronomer Alan Hale and American amateur stargazer Thomas Bopp independently discovered a new comet just beyond the orbit of Jupiter. Considered by many astronomers to be one of the greatest comets of all time, Comet Hale-Bopp is immense. Its core is almost 25 miles (40 kilometers) in diameter, more than 10 times that of the average comet and 4 times that of Halley's comet. Hale-Bopp's closest pass to Earth occurred on March 22, 1997, when it was 122 million miles (196 million kilometers) away. Despite its great distance from Earth, the huge comet was visible to the naked eye for months before and after that date. Astronomers believed it was one of the longest times any comet had been visible. They estimate that Hale-Bopp will next visit the vicinity of Earth 3,000 years from now. In mid-1997, scientists announced that small comets about 40 feet (12 meters) in diameter are entering Earth's atmosphere at a rate of about 43,000 a day. The discovery was made by the polar satellite launched by the National Aeronautics and Space Administration (NASA) in early 1996. American physicist Louis A. Frank, the principal scientist for the visible imaging system of the satellite, first proposed the existence of the bombarding comets in 1986. These comets do not strike the surface of Earth because they break up at heights of 600 to 15,000 miles (960 to 24,000 kilometers) above ground. Sunlight then vaporizes the remaining small icy fragments into huge clouds. As winds disperse these clouds and they sink lower in the atmosphere, the water vapor contained within condenses and falls to the surface as rain. Scientists estimate that this cosmic rain adds one inch of water to Earth's surface every 10,000 to 20,000 years. Over the immense span of Earth's history (4.5 billion years), this amount of water could have been enough to fill the oceans. Scientists also speculate that the simple organic chemicals (carbon-rich molecules) these comets contain might have fallen on Earth as it was first developing. They may have provided the groundwork for the development of the wide range of life on the planet. Comets are considered among the most primitive bodies in the solar system. They are probably debris from the formation of our sun and planets some 4.5 billion years ago. The most commonly accepted theory about where comets originate was suggested by Dutch astronomer Jan Oort in 1950. He believed that over 100 billion inactive comets lie at the frigid, outer edge of the solar system, somewhere between 50,000 and 150,000 astronomical units (AU) from the Sun. (One AU equals the distance from Earth to the Sun.) They remain there in an immense band, called the Oort cloud, until the gravity of a passing star jolts a comet into orbit around the Sun. In 1951, another Dutch astronomer, Gerard Kuiper, suggested that there is a second reservoir of comets located just beyond the edge of our solar system, around 1,000 times closer to the Sun than the Oort cloud. His hypothetical Kuiper Belt was confirmed in 1992 when astronomers discovered the first small, icy object in a ring of icy debris orbiting the Sun. This ring is located between Neptune and Pluto (sometimes beyond Pluto, depending on its orbit), some 3.6 billion miles (5.8 billion kilometers) from Earth. Since 1992, astronomers have discovered more than 150 Kuiper Belt objects. Many of them are upwards of 60 miles (96 kilometers) in diameter. Several are much larger. In 2000, astronomers discovered one, which they call Varuna, that measures 560 miles (900 kilometers) in diameter, about one-third the size of the planet Pluto. Astronomers believe the ring is filled with hundreds of thousands of small, icy objects that are well-preserved remnants of the early solar system. They are interested in studying these objects because they want to know more about how Earth and the other major planets formed. There are many theories as to what happens at the end of a comet's life. The most common is that the comet's nucleus splits or explodes, which may produce a meteor shower. It has also been proposed that comets eventually become inactive and end up as asteroids. One more theory states that gravity or some other disturbance causes a comet to exit the solar system and travel out into the interstellar medium.